I have sincerely put all my efforts into creating edges on kitchen knives being used in professional kitchens that would retain a good working edge for as long as possible. KEEPING KNIVES SHARP. THAT’S THE PROBLEM. 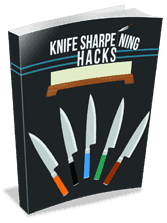 How to get a knife to stay sharp for as long as possible. Professional sharpeners and likely all folks serious about the process of knife sharpening very likely think about edge retention at some point along their sharpening journey. It is a topic I have agonized over for years and worked very hard at, trying different final edges with a variety of grits. I have sincerely put all my efforts into creating edges on kitchen knives being used in professional kitchens that would retain a good working edge for as long as possible. Taking the knives I was working on into consideration, knowing that they would be used by different folks in an extremely hectic environment, my goal was to have them last four weeks. In almost every case it ended up in frustration for me until I learned a few things and I have since come to an important realization. (Of course I applied my best edge retention techniques to all my customers knives since the vast majority of them belong to home chefs, people like us). Here is what happened. I would do my due diligence and create an edge taking into account the steel in the knife I was given to sharpen, the work environment and with hope that since I did my part, the owner of the knife would do his or hers. In my opinion, Edge Retention is a team effort, my responsibility lies in thinking ahead and building a strong edge, sharp of course but also strong. In other words, if I just wanted to impress the hell out of someone I could take their 40 dollar chef knife and sharpen it at 15 deg or less and make it truly razor sharp. However, the edge would fail very fast, on day one perhaps (I have tested this of course) and this serves no purpose. So I would sharpen it at an angle as close to 20 deg per side as possible and make it as sharp as I possibly could. The knives I am referring to are they typical mid level Henckels, or Victorinox and Russell Dexter knives, average knives with average or below average steel. This went on for a number of years and then the source of the issue was revealed to me. Please remember that this article and my thoughts are purely my opinion and based on personal experiences but also remember that in any given year I sharpen thousands of knives. I heard that the knives were not staying sharp for more than a week or two. So I went through the process of making test knives, similar knives sharpened/finished at different grits but the angles were pretty much the same. The plan was for the users of these knives to put them through their paces but it came to me that I had no control of this, any results would be nice to know but not enough to validate an opinion. And there’s a reason. The good folks using the knives in some cases didn’t really care too much about them, they are very busy and not able to take the time to “test” knives and in many cases they were not their own knives so they didn’t make too much of an effort to protect the edges, and worst of all, they would steel them very roughly and knock the edge off immediately. This went on for a bit, any attempts at enlightening them were fruitless, it was my fault in their eyes. In fact, I came to understand over a long period of time that poor steeling habits are a major culprit to edge degradation. I saw them slam the steel against an edge that I had just carefully sharpened, meticulously holding my angles and in my humble opinion, one cannot duplicate that with approach to steeling. It got worse, in some cases when I asked how they sharpened their knives they just took out a Steel, the knives would stay sharp for years I was told. (I no longer sharpen for many of them). This was never the case for an entire kitchen staff, but in my business it just takes one individual to form an unfounded and inaccurate opinion and set the stage for future issues. Also, folks are terribly busy in kitchens, and despite their good intentions, edges slip away so to speak, it doesn’t take long and we are not talking about preparing five onions and five potatoes, it’s fifty of those. Here is the deal and again. 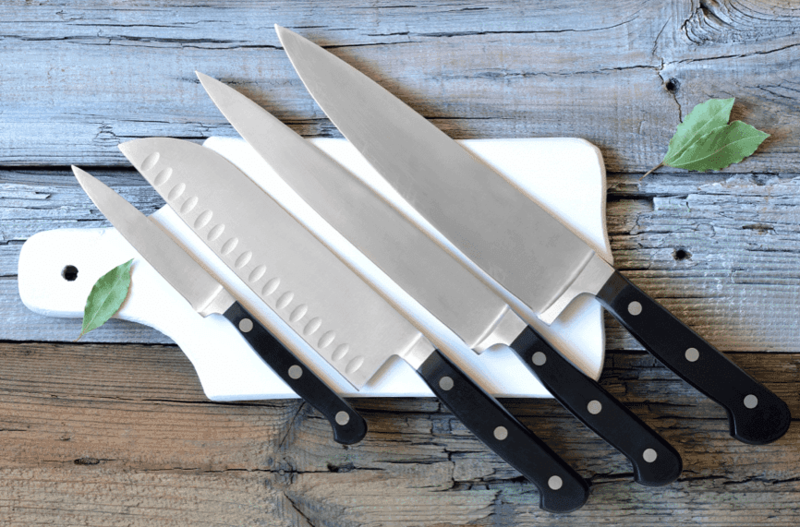 A lot of effort has been made by talented people to test knives and examine edge retention in attempts to squeeze the last ounce of sharpness out of the knife. HOWEVER, these tests are done in controlled environments, the knives I sharpen, your knives, do not operate in a controlled environment where someone is cutting something the exact same way over and over. In the real world, many of the knives I sharpen, especially in busy kitchens are used by different people, they cut a variety of different things and are placed into a dishwasher. In the meantime they are subjected to steel abuse by a user attempting to “sharpen” the knife with that ridiculously poor process that we often see on TV. How can that possibly re-align and edge, the entire edge from heel to tip. SO PETER, HOW DO YOU DEAL WITH EDGE RETENTION? 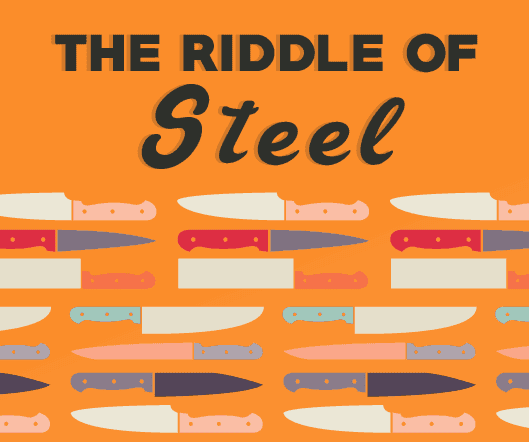 A sharp knife… will it last? Here is how I deal with edge retention now. I don’t deal with it. I do my best to build a “Smart Edge“, one conducive to the environment it will be used in and I leave it to it’s owner to do his/her part in protecting the edge as much as possible. That is simply being aware that the Cutting Edge of a knife, the Primary Edge is a microscopically thin piece of steel that is constantly under pressure. Be vigilant despite the hectic pace and mindful of the edge. Place it facing away from you when not in use. Do not steel it if you are not going to do it properly. Do it with focus and knowledge of what it is that you are trying to do. Forget what you see them do on TV. Understand that a Steel even when used properly is simply moving fatigued metal back and forth with the goal of re-aligning it. This is temporary solution only, the dulling cycle has been slowed down a little, it is still unfolding. The best solution is to make Edge Retention a moot point by either having the knife sharpened once a month or using a better maintenance program. Beware that this month period is going to change for different users using different knives cutting different items. 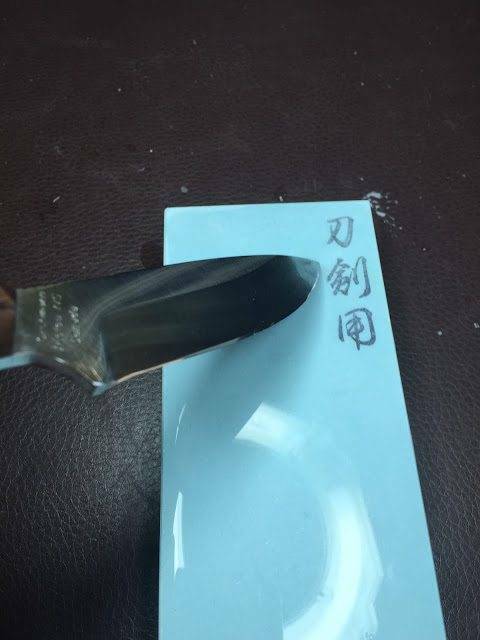 The best way I believe to maintain an edge is to use a medium to fine grit Japanese Water Stone, think of it as a rectangular hone and use trailing strokes and light to medium pressure. Nothing is as good and effective as sharpening on a stone. This serves another purpose. Picture a communal two thousand grit water stone like the Naniwa Aotoshi, the wondrous, Green Brick of Joy and that stone being set in a place that is easily accessible and for everyone’s use. Now picture the Executive Chef, or Sous Chef, a Leader, using that water stone to maintain his/her knife. 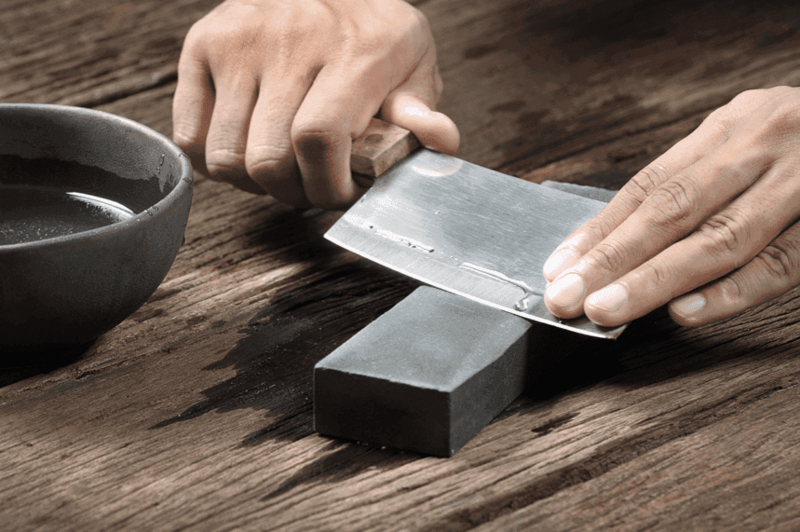 The person starts with a sharp knife, prior to commencing the days work he/she goes to that water stone and takes advantage of the incredible abrasive powers to hone his knife into slicing perfection, using just enough pressure to achieve the desired results. If done on a regular basis, could be every day, the process only takes a couple of minutes. Any fatigued metal is relieved of it’s duty and parted from the mother ship. Not only is the person keeping that knife functional, muscle memory/sharpening skills are elevated, layer upon layer. This isn’t even the best part. The Leader, leading by example is doing his/her part by keeping the knife as sharp as it should be. The Followers are seeing this taking place. Sooner than later, some of those followers will visit that water stone and eventually, many will come to love that water stone. Not all but some will and some will become better than others. This is how new Sharpeners are born. The Leader should ensure that this process is being viewed, at least the first time and must provide an explanation of the benefits, they need to be enlightened, made aware that sharp knives are an integral part of their lives. No dull knives allowed in my kitchen. Dull knives should be unacceptable in a professional kitchen (or any kitchen in general, really). They are dangerous and have a negative impact on the flavour of food. A chef has spent years of his/her life creating a menu, why would that person allow those passionately created flavours to be compromised by a dull knife? It is simple matter of allowing the abrasive properties of that 2, 000 grit stone for example to gently remove the fatigued metal that is hindering the knifes performance Now if the Executive Chef is not comfortable with demonstrating the use of this maintenance process using a stone, bring in a professional sharpener and set it up. I would love to have this opportunity, yes, there would be folks in the background scoffing at the idea but eventually, even they could not argue the fact that a new world has be opened to them, that water stone has unlocked the door to sharp knife heaven, it is simply a matter of taking that first step, it is the responsibility of the Executive Chef to lead the way. I emphasize trailing strokes with gentle pressure to prolong the life of that edge, that fatigued metal must go. Eventually, more pressure will be required, a coarse stone brought into the picture or the knives resharpened so that the cycle can repeat itself. The goal here is to eliminate dullness from all knives, there is no place for them. Now I completely understand that chefs are busy folks, hectic work, long hours, brutally busy but I don’t believe there is an excuse for a chef to use a dull knife. I don’t meant it has to be beyond razor sharp, it has to be at the level where everything being prepared is done so effortlessly in terms of the knife. The chefs I see, and I see many are among the hardest working individuals I have ever had the opportunity to witness. So time is not on their side but Sharp is. In my experience the restaurants who do not steel and allow me to look after the knives every four to six weeks have the sharpest knives to use throughout that period. However, if they adopted this procedure of maintenance, it would be even better. Owner of "New Edge Sharpening" in Halifax (Canada). Sharpening teacher on KnifePlanet. Served for thirty six years in the Royal Canadian Navy. I worked in the meat processing industry for 13 years and it took me approximately 5 years to achieve the desired edge on my knifes which were high carbon steel. I use an aluminium oxide set stone which I used soapy water as the lubricant/coolant. I systematically maintain a clean surface using a creme cleanser to remove any metal build up. I finish on a variety of sharpening steels of varying surfaces ranging from coarse to smooth. I finish with a smithfield “pipe” steel which is almost glass finish. This results in a long lasting razor sharp edge which can be maintained on a sharpening steel.